Marko Vatovec was born in Koper, a small Slovenian coastal town, where he started his musical education. After finishing grammar school, where he was introduced to choral singing, he first studied musical pedagogy at the Pedagogical Faculty of the University of Ljubljana and then continued at the department for Musical Pedagogy at the Academy of Music of University of Ljubljana. He graduated with a choral concert under the mentorship of Dr. Mirko Cuderman. For his diploma concert he got awarded the Prešeren Award of the Academy of Music. He then studied conducting in the class of Anton Nanut and assisted at many international master classes with Eric Ericson, Frieder Bernius, Julius Kalmar and many others. 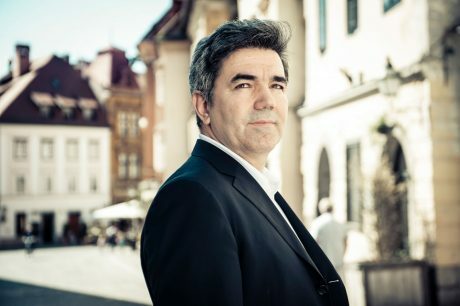 His professional conducting career started with a Slovenian chamber choir, at the beginning as the assistant conductor, and later as a guest conductor. Soon after, he began his pedagogical career at the Academy of music in Ljubljana, where he still works as associated professor of choral conducting and choral singing. Many successful young Slovenian choral conductors have graduated under his mentorship, a few of whom also work abroad and enjoy international acclaim. He conducted different ensembles, starting with mixed youth choir of Koper Grammar School and he was later one of the founders of the youth mixed choir Veter at the Jeunnesse Musical in Ljubljana. He also conducted the Slovenian Philharmonic Choir, choirs Vox Europae, Mimas, the Kosovo Philharmonic Choir, the Orchestra of Slovenian Soloists, the RTV Symphony Orchestra of Slovenia and a few others. Marko Vatovec is a regular member of national and international juries at choral competitions and a lecturer at national and international master classes and symposiums. In his long artistic career, a part of his repertoire included many first performances of various a cappella and vocal instrumental compositions by Slovenian composers.